Learn about UC San Diego's Controlled Substances Program. Controlled substances are drugs or chemicals whose manufacture, possession, and use are regulated by the government. 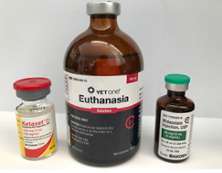 UC San Diego currently holds a federal Drug Enforcement Administration (DEA) registration governing the use of controlled substances for research, veterinary, and teaching purposes. UCSD's Controlled Substances Program (PDF) describes authorization to conduct work with controlled substances, employee and institutional responsibilities, and operational requirements. The CS Program is administered by the CS Program Manager in Environment, Health & Safety (EH&S). At UCSD, controlled substances include all DEA-scheduled substances, DEA List 1 chemicals, and California Precursors. If a chemical you require for research is classified as a CS or listed chemical, you must have an approved Controlled Substance Use Authorization (CSUA) before work can begin. Clinical trials performed on campus through the pharmacy do not require a CSUA. Additional authorizations and registrations from the CS Program Manager may be required for certain project-specific substances, locations, or purposes not covered by the university's standard DEA registration. The Controlled Substance Use Authorization (CSUA) online application provides a central and secure resource for the essential business processes and internal controls of UC San Diego's Controlled Substance Program, from application and authorization to inventory and personnel management. CSUA: PIs are responsible at all times for maintaining a current CSUA, accurate online inventory and on-site Log Book, and supervising their CS facility and Authorized Personnel in compliance with UCSD's Controlled Substances Program. Secure storage and inventory: The PI will provide EH&S-approved, secure storage and ensure restricted access and key control. CS Usage Log Sheets and Log Books must be kept in the approved controlled substances storage area. Training: All personnel working with CS, including PIs, are required to complete the Controlled Substances Training eCourse on UC Learning Center, with refresher training required every 4 years. Sabbatical: A CSUA may remain active during sabbatical leave when an acting PI is named in writing and approved by the Department Chair and CS Program Manager. Alternatively, the Department Chair may serve as the acting PI. Authorized Personnel are individuals designated by the PI to access and work with controlled substances under a specific CSUA. Final approval of Authorized Personnel rests with the CS Program Manager, following verification of DEA-required information applicants provide on the Personnel Screening Data Sheet. Having access to CS is a privilege and can be revoked by the PI or EH&S. Use CS exclusively for the purpose stated in CSUA. Maintain a secure storage location for CS at all times. Return CS to the secure storage location when not in use. Record dispensation of any CS in the Log Sheet. Do not share CS with non-authorized personnel (refer to CSUA for authorized list). Do not dispense or log out CS for use by others. Report CS inventory discrepancies, suspected misuse, or theft to the CS Program Manager, (858) 534-1362, immediately. Training: Authorized Personnel working with CS are required to complete the Controlled Substances Training eCourse on UC Learning Center, with refresher training required every 4 years. CSUA applications: Department Chairs review and approve or reject CSUA applications for their department. Department Chairs cannot authorize their own CSUA. Inventory and Log Sheets: Department Chairs are responsible for ensuring that a current inventory of all CS under his/her purview is maintained by the PI on CS Log Sheet in an on-site Log Book available for periodic audit by EH&S and/or the DEA. Final approval of all CSUA applicants and Authorized Personnel rests with the CS Program Manager, following verification of DEA-required information applicants provide on the Personnel Screening Data Sheet. PSDS Forms for PIs and Applicants are available on the EH&S Forms page in the Controlled Substances section. See CS: How to Order for requisition procedures. See CS: Disposal for instructions. Note: To dispose of pharmaceuticals that are not CS, see Pharmaceuticals Disposal. UCSD Controlled Substances Program Procedures (PDF) – Describes UCSD's CS Program in detail. It is your responsibility to immediately report any controlled substance (CS) problems to the PI and EH&S. This includes discrepancies in usage logs and disposal records, and any suspected theft, loss or disappearance of CS. The Controlled Substance Program will investigate any reported issues and contact UCPD and the DEA if required. You may report illicit activities, anonymously if you wish, by calling Wendy Scott at 858-534-1362 or Monica Esswein at 858-534-9016. Call immediately after determining the material was lost, stolen or improperly disposed. You may also contact the CS Program with any additional questions by calling the numbers above or emailing ehscs@ucsd.edu. Contact the EH&S Controlled Substances Program, (858) 534-1362 or 534-9016.